There comes a time when we all question our lives. Some do it once in awhile, some do it when things are going crazy, and some do it daily… well, most of us do it daily, and Rapid Lemon Productions‘ latest offering, Love is a Blue Tick Hound by Audrey Cefaly, Directed by Donna Ibale, Lee Conderacci, Betse Lyons, and Lauren Erica Jackson, and Set Design by Reese Siedlecki tries to answer some of those questions through four two-person shorts exposing the lives of folks from different walks of life with very different questions and problems. In a nutshell, Love is a Blue Tick Hound is a delving introspective on relationships and ask the serious questions of life. 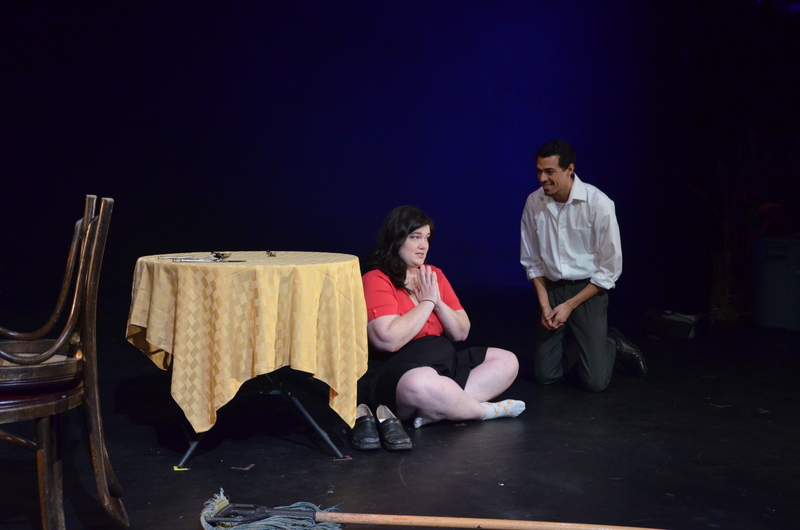 The entire production is made up of four short two-person plays that ask life’s questions such as “are we happy or are we settling?” or “am I afraid to be alone or am I okay with that?” with a blend of poignancy and comedy that gives the audience emotional peaks and valleys that make for good theatre. Set Design by Reese Siedlecki is semi-minimal but quite appropriate to make it easy to present four different stories. Set pieces are brought on and off stage to set the scenes and this design does its job superbly. With the use of lawn chairs, a cafe table, willow weeds, and a living room set transports the audience into the scenes easily. Transitions are a bit lengthy and clunky, but not enough to deter the flow of the piece and the cast is well-rehearsed and precise in the changes. Light and Sound Design by Allan Sean Weeks and Max Garner, respectively, add great value to this production while Weeks sets the scene and times of day brilliantly with subtle light changes and accents while Garner produces a flawless sound design that puts the audience smack dab in the scene with a well thought-out design that doesn’t hinder, but helps the setting and adds that extra authenticity. Also, I found myself Shazam-ing the transition tunes that were used because, well, they were not only fitting but pretty awesome tunes! 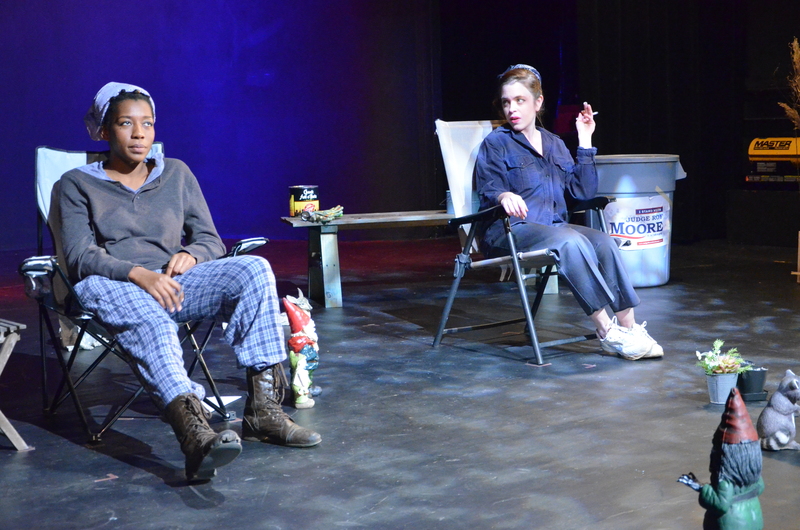 Moving on to the shorts themselves, we are first presented with Fin and Euba, Directed by Donna Ibale, featuring Carolyn Koch as Fin and Lauren Erica Jackson as Euba. This short concerns best friends Fin and Euba (of course) as they complain about their current situation and dream about changing it but don’t do much to do so, as if they are settling for what they go or are afraid to move forward. Director Donna Ibale has a great comprehension of this text and presents the piece in an authentic, down-home way that works nicely. Koch understands her character and portrays her fittingly as someone who wants so much more but can’t seem to figure out how to get it while Jackson, as Euba, portrays her character beautifully as someone who doesn’t dare to want more. Both actresses have a good chemistry and work well off each other to present a deep connection and dependency upon each other. Second we are presented with Clean, Directed by Lee Conderacci, featuring Betse Lyons as Lina and Justin Johnson as Roberto. In this piece, food service two co-workers discuss relationships and wants before opening and make certain discoveries about each other that were right in front of them the entire time. Director Lee Conderacci’s casting is spot on and she presents this piece in a minimally, but effectively. Lyons embodies her character and connects with the audience making you empathize with her character’s turmoil and her confidence and onstage presence makes one take notice. Johnson gives a superb performance as the immigrant dish-washer with a secret yearning and common sense way of looking at things. His performance is spot-on making him and this piece a highlight of this production. 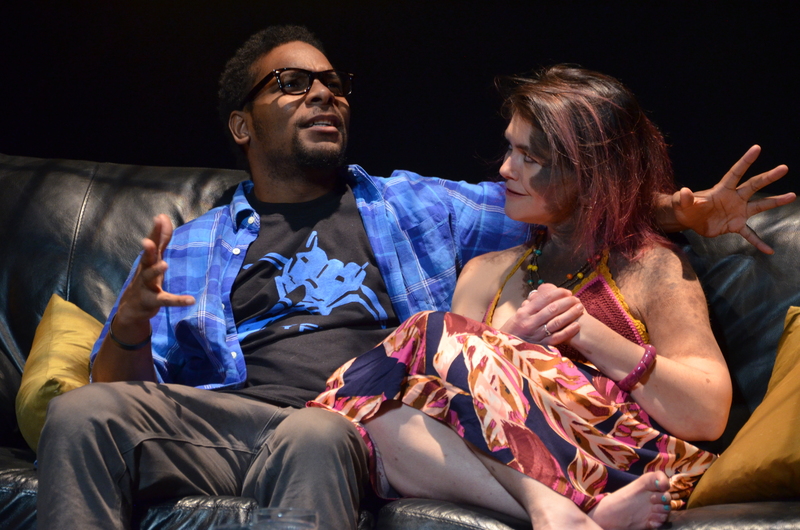 Next is The Gulf, Directed by Betse Lyons, featuring Donna Ibale as Kendra and Aladrian C. Wetzel as Betty. This short begins with what simply looks like two people on a fishing excursion in a deep southern watering hole. 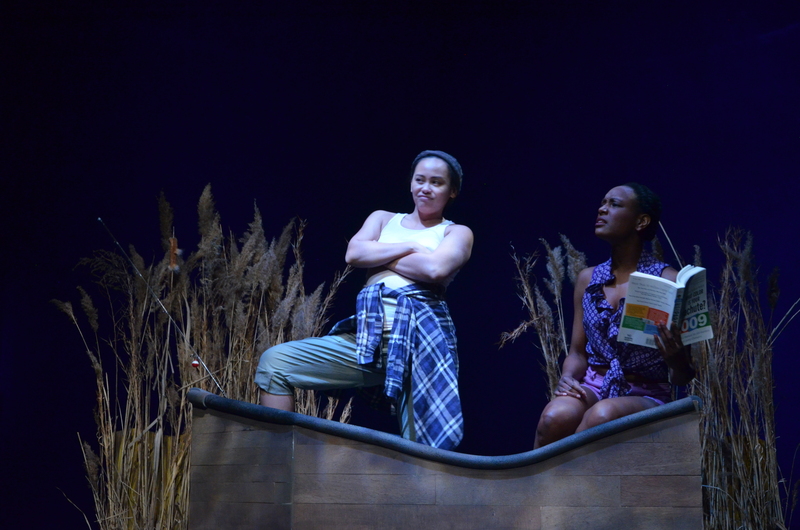 However, we discover Betty, played flawlessly by Wetzel, is trying to better herself with plans of schooling and moving out of wherever they currently are and Kendra, played by an able and intense Ibale, is content to stay right where she is. Director Betse Lyons seems to have a tight grasp on this material and presents it simply and concisely with her choice of setting and casting. Wetzel, gives a glimmer of grace and elegance just under the surface of her character and it works beautifully for the scene. The despair and want this actress exudes makes one want to just take her, hug her, and tell her everything’s going to be okay. Ibale, too, portrays her rough around the edges character impeccably with a smidgen of vulnerability that she tries to hide but can’t help but let show every now and then. This piece and its actresses are certainly standouts in this production with spot on performances. Finally, the production rounds out with Stuck, Directed by Lauren Erica Jackson, featuring Mike Smith as Rob and Lee Conderacci as Maggie. This short deals with a second date between two people who might not know exactly what they’re looking for and trying very hard to impress others. Director Lauren Erica Jackson gives a good showing in her presentation and her understanding of the material is evident. Conderacci gets the fundamentals of her character, a strong woman who has a definite individuality but still wants to “fit in,” and she portrays this nicely but her delivery gets a little scripted at times, but her energy and confident stage presence makes for a lovely performance. Her partner, Mike Smith is the stronger of the duet and is, hands down, another standout in this production. His portrayal of his character, a nervous young man going into a second date and just wants to make a good impression, is on point and natural. He has a strong stage presence with a good comedic timing making for a performance that is a joy to watch. Final thought… Love is a Blue Tick Hound from Rapid Lemon Production is a perfect fit for Women’s Voice Theatre Festival and the tries to answer some of life’s questions through a series of four short plays directed by a different director (all of whom are women and double as actors in one of the other plays) and allows for various visions of a main theme and each play is cast nicely with actors who work well together. Presenting this piece in a minimalist fashion is a wise choice as is forces concentration on the text and performances making the scenes uncluttered and more meaningful. Overall, this production is well through-out and well-presented and is worth checking out if your wandering around looking for good live theatre in the Baltimore-Washington corridor. 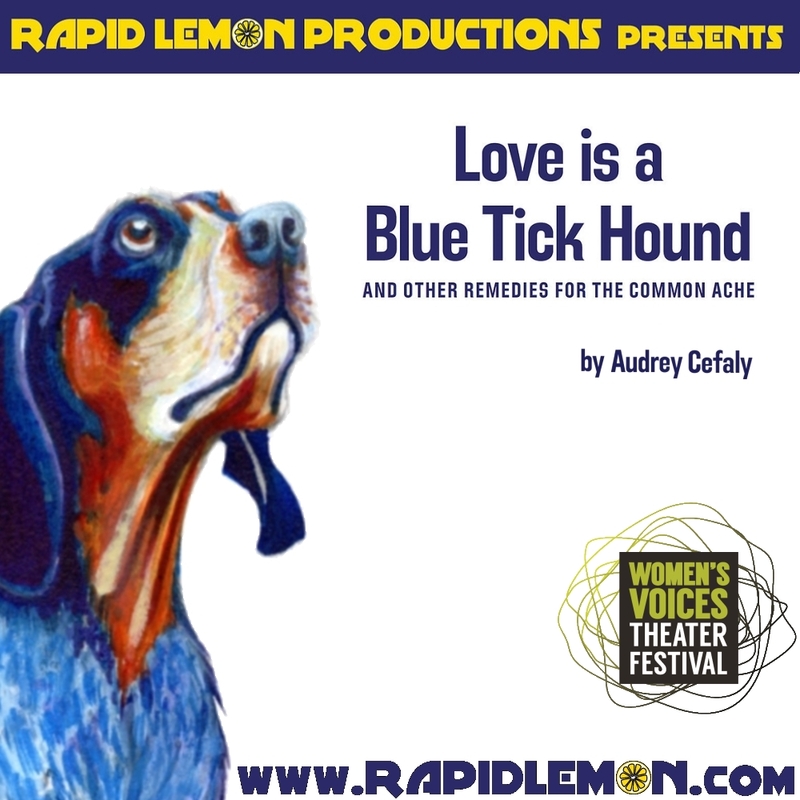 This is what I thought of Rapid Lemon Productions’ production of Love is a Blue Tick Hound… What did you think? Please feel free to leave a comment! Love is a Blue Tick Hound will play through January 21 at Baltimore Theatre Project, 45 W. Preston Street, Baltimore, MD and February 9-17 at Logan Fringe Art Space: Trinidad Theatre, 1358 Florida Avenue, NE Washington, DC. For tickets, you can purchase them online.